After our heavy lunch in John and Yoko, we went straight to Gelatissimo to have dessert. 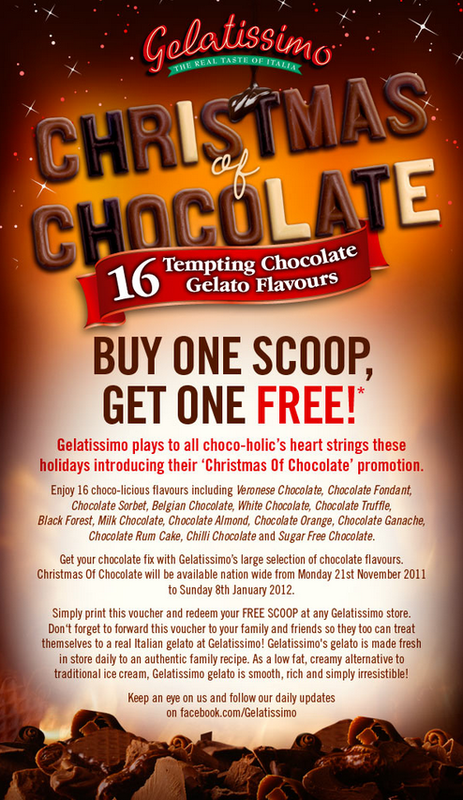 I received a Buy 1 Get 1 flyer from Gelatissimo since I subscribed in their mailing list and all I have to do is print the flyer out and present it to their staff. You may only choose from the chocolate flavors though since their promo is called Christmas of Chocolate. But who doesn't love chocolates right? Plus, they have 16 different chocolate flavors so you'll have more choices to choose from. We originally plan to use 2 flyers so we could have 2 scoops each. But since we were really full and I was also having coughs and colds that time, we decided to just use 1 flyer. I got the Chili Chocolate while D got the Veronese Chocolate. I recommend getting the Veronese Chocolate cause it was really delicious and tasted like Ferrero Rocher chocolates. The Chili Chocolate was really spicy and hot. It was good at first bite because it tasted like dark chocolate but the spice of the chili kicks in afterwards. I had to mix some of the Veronese chocolate gelato into the Chili chocolate to lessen the spiciness of it. Thank you so much for visiting Gelatissimo GB5 branch. We appreciate your comments so we can serve you better. We apologize for the long lines, though. Hope to see you there again. Happy New Year! 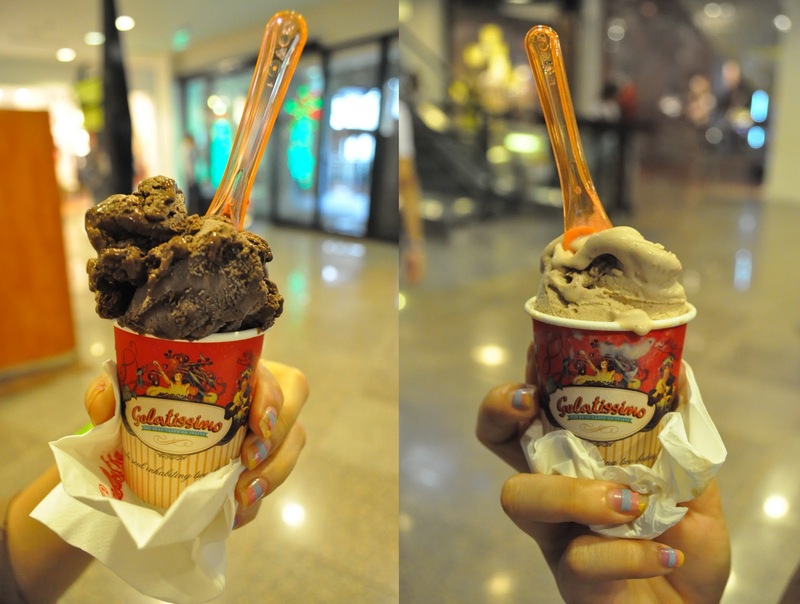 gelatissimo is love! lahat ng flavors masarap. I wanna try the chilli chocolate. I'm really loving the theme/design of your website. Do you ever run into any web browser compatibility problems? A small number of my blog readers have complained about my website not working correctly in Explorer but looks great in Opera. Do you have any ideas to help fix this issue? to tense his technique and invariable info end-to-end all your debts.